The number of FELIX brand showrooms has been increasing annually. In the last 3 years more than 10 new furniture showrooms have been opened in the regions of Russia, the Republic of Kazakhstan and Estonia. Currently the Company comprises more than 60 brand showrooms, the total area of which is more than 32,000 m2. Each showroom has a wide range of furniture produced in the country and abroad, as well as a range of office chairs, armchairs, upholstered furniture and accessories. The specialists can select the necessary accessory parts to match the collection. Professional designers will develop a unique design project and consult on furnishing of an office or a hotel. Thanks to the extensive experience and high professional skills of our specialists we guarantee that we implement unique projects of any difficulty for each client quickly and with high quality products. 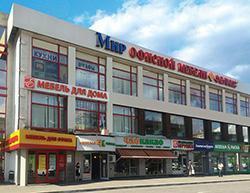 The well-developed dealer network covers almost all regions of Russia and the CIS. At the moment the Company’s data base reckons 900 dealers. The Company has a smoothly running service system thanks to which the products can be delivered to the most remote Russian cities and towns. The dealers are regularly informed about new arrivals. They receive various promotional items, are trained, take part in fairs and acquire FELIX-made furniture free of any distribution margin.